This recipe is the property of Tootall and released under the CC Attribution-NonCommercial-Sharealike 4.0 license. You may not copy, derive or commercialize this recipe without following the terms of this license or the explicit permission of the creator. Easily one of the more flavorful 3-2-1 recipes I have mixed. Everytime blends nicely together. Best of all doesn’t need a long steep. Glad I decided to mix a 60ml instead of a 30ml. Not only is this a tasty treat, it’s also a great base recipe to build off off. It’s rich, creamy, and has some serious depth to it for being three flavors. The toasty caramel and vanilla really liven up the custard. I love the simplicity here; it satisfies me on many levels. Good work, Tootall! For a simple recipe with just three ingredients and 6% total flavor, this thing is awesome. It’s rich and satisfying and really demonstrates what both Creme Brulee and Custard by INW are and what they do. I wonder whether a darker vanilla might work even better than Shisha V here because it is a little on the bright side, but without trying it out I have no way of knowing. A vanilla that rides too high might interfere with those lovely caramelized sugar crust top notes. It might get a little boring as an ADV but if you switch flavors frequently enough it isn’t, and it tastes like it would welcome all kinds of additional ingredients that might make it more interesting: In other words, it tastes like the perfect base for a creme brulee recipe to accent however you please. Mix it up as written first and then see what ideas it gives you. I’m thinking almond would excellent. 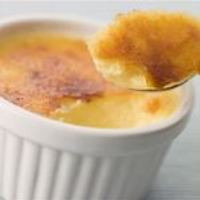 I’ve looked at culinary recipes for almond, almond-vanilla bean, orange-almond, and amaretto creme brulees and they all look like “I want to vape that.” Could be as simple as adding 1.5 to 2% FA Almond to this. Or 1% INW Marzipan for that amaretto-type creme brulee and keeping with the all-INW theme here. Anyway, beautiful simple recipe just the way it is. Thanks, TooTall! 24-6-18: This is my favourite 3-2-1 recipe so far. So bloody rich and creamy off the shake. Really good job Sir Tootall. Will post an update in a week. Haven’t been able to put this stuff down, made it on 4/26, starting vaping off the shake and it’s only gotten better. I will say that for the profile this is definitely a great snv. Good job man!